The remains of Neve Dekalim after the Sharon Family's expulsion of all Jewish residents. The Jewish People share in the pain of the Gush Katif families who are suffering a second mourning period for their departed and murdered loved ones who were not allowed to rest peacefully in their graves. On Thursday, September 1st, Av 27, the State Funeral for those reinterred from Gush Katif will be held in Jerusalem, the courtyard in front of Hamashbir on King George Street at 4:00pm. The euligies will be said in the courtyard and from there the procession will leave for Har Zeitim, Mount of Olives. 1. Reburial Eulogy for Elkana Goby HYD -- a solider killed in action in Gush Katif. Elkana was reburied yesterday as part of the Sharon familiy's "Disengagement" plan. This is heartwrenching. 2. Ineptitude, corruption or just plain evil? Read part 1 (in Hebrew) of all the screw-ups against the Israeli citizens, expelled from Gaza and Northern Shomron. Israel has a new disengagment problem to worry about. Not one rabbi has given halachik permission for Israel to destroy the shuls in Gush Katif. The government and army are begging the rabbis, or any of them, to give some sort of halachik permissibility to tear them down. The rabbis are saying that the shuls should be boarded and locked up, and international forces should watch the shuls. Otherwise, they claim what right does Israel have to tell the rest of the world not to destroy old shuls throughout Europe. 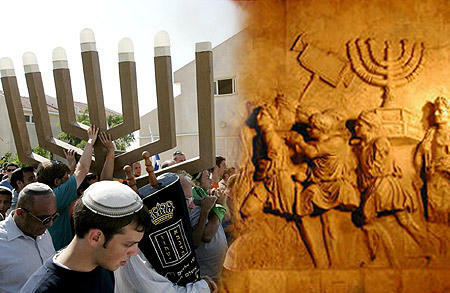 There are thousands of shuls around the world today, with no minyan in them, yet they remain out of respect to Judaism. However, if Israel is able to destroy shuls in Gush Katif - how can they expect anyone else not to do the same? How to Repent for "Disengagement" Crimes. Gush Katif, Shirat Hayam. 18-August. The IDF and police have totally surrounded the Beit Knesset of Shirat Hayam, so that a sea of black, blue, and green totally hides the sand in all directions. Atop the shul's roof, is the loudspeaker poll, which allows for 360 degree announcements (which used to be used for security purposes). One of the newer residents of Shirat Hayam. who moved into a tent, 1 month earlier -- Moshe Feiglin, takes the microphone and addresses the soliders. "I want to tell you a story which happened in the Shomron hills last year. As many of you know, the Israeli government has declared war on many settlements and outposts over the past years, and has used trememdous force to accomplish this objective. In one outpost, Border Police destroyed the house and expelled the family living there. Yet, something happened. One of the border policemen later on decided to be "chozer b'tshuva" and become closer to Judaism. He asked his rav, how to repent for demolishing a fellow Jew's home. His rav replied that he needed to find the family of the home he demolished, and ask their forgiveness. After searching for some time, he located the family, and explained his predicament. The family didn't forgive him, and the dejected policeman returned back to his rav for additional guidance. His rav told him that he would have to rebuild the home for the family. For the past year, this policeman has left his job, and is building a home for this family, with his own 2 hands, brick by brick. Soldiers and Police - I ask that you bring a pen and paper with you to every home you "visit" in Gush Katif, and write down a contact number for each family. For the day will come when you too will want to repent for what you are doing now, and you will need to find each family individually, and beg for forgiveness, and maybe even have to personally rebuild these homes." אָבִינוּ שֶבַּשָּׁמַים, צוּר יִשְׂרָאֵל וְגוֹאֲלוֹ, בָּרֵך אֶת עַמְךָ בְּאֶרֶץ יִשְׂרָאֵל. הָגֵן עָלָיו בְּאֶבְרַת חַסְדֶּךָ וּפְרֹשׂ עָלָיו סֻכַּת שְׁלוֹמֶךָ. חַזֵּק אֶת יְדֵי מְגִנֵּי אֶרֶץ קָדְשֵׁנוּ, וְהַנְחִילֵם אֱלֹהֵ-ינוּ יְשׁוּעָה וַעֲטֶרֶת נִצָּחוֹן תְּעַטְּרֵם, וְנָתַתָּ שָׁלוֹם בָּאָרֶץ וְשִׂמְחַת עוֹלָם לְיוֹשְׁבֶיהָ. וְאֶת אַחֵינוּ כָּל בֵּית יִשְׂרָאֵל, פְּקָד-נָא בְּכָל אַרְצוֹת פְּזוּרֵיהֶם, וְתוֹלִיכֵם מְהֵרָה קוֹמְמִיּוּת לְצִיּוֹן עִירֶךָ וְלִירוּשָׁלַיִם מִשְׁכַּן שְׁמֶךָ, כַּכָּתוּב בְּתוֹרַת מֹשֶה עַבְדֶּךָ, אִם יִהְיֶה נִדַּחֲךָ בִּקְצֵה הַשָּׁמַיִם, מִשָּׁם יְקַבֶּצְךָ ה' אֱלֹהֶ-יךָ וּמִשָּׁם יִקָּחֶךָ. וֶהֲבִיאֲךָ ה' אֱלֹהֶ-יךָ אֶל הָאָרֶץ אֲשֶׁר-יָרְשׁוּ אֲבֹתֶיךָ וִירִשְׁתָּהּ, וְהֵיטִבְךָ וְהִרְבְּךָ מֵאֲבֹתֶיךָ וְיַחֵד לְבָבֵנוּ לְאַהֲבָה וּלְיִרְאָה אֶת שְׁמֶךָ, וְלִשְׁמֹר אֶת כָּל דִּבְרֵי תוֹרָתֶךָ, וּשְׁלַח לָנוּ מְהֵרָה בֶּן-דָּוִד מְשִׁיחַ צִדְקֶךָ, לִפְדוֹת מְחַכֵּי קֵץ יְשׁוּעָתֶךָ. הוֹפַע בַּהֲדַר גְּאוֹן עֻזֶּךָ עַל כָּל יוֹשְׁבֵי תֵבֵל אַרְצֶךָ, וְיֹאמַר כֹּל אֲשֶר נְשָׁמָה בְאַפּוֹ, ה' אֱלֹהֵ-י יִשְׂרָאֵל מֶלֶךְ וּמַלְכוּתוֹ בַּכֹּל מָשָׁלָה, אָמֵן סֶלָה. The past 2 weeks have left me exhausted beyond my imagination; mentally, physically, and spiritually. I have seen evil, up close, far more clearly than ever before. While I have dozens of stories I wish to write over the next few days, I want to start with a list of the corruption and evil that I personally witnessed by the Sharon Family's chokehold over the State of Israel, the "Minhelet Sela" expulsion office, and that of ordinary Israelies who are completely devoid of compassion. 1. While the Sharon Family has been sending out press releases to the world press, that "Every Settler has a Solution" - nothing could be farther than the truth. While the "Minhelet Sela", and its head, Yonatan Bassi, have been telling everyone that "the settler's had 6 months to pack, so why are they complaining" -- I would like to understand why there are hardly any real solutions in places for the Gaza refugees. I have been personally hosting a family of 7, who were thrown into a hotel in Northern Israel (Natzrat Elite), with 2 meals a day, and told, "have a nice life." They were forcebly removed from their home in Neve Dekalim at 2:00 AM, and carrying only 5 small knapsacks were dumped in this hotel. In the morning, there was noone there from "Sela" to help them...none of the leftists that are dancing on the rooftops for the Gaza Expulsion...only religious Jews from the surrouding areas (kibbutz Lavi, kibbutz Beit Rimon and Moreshet) who came to volunteer and help their fellow Jews. The kids were racing around the hotel, having never been in a hotel before, and their parents were trying to keep up with them. A hotel atmosphere is not the place to dump a family of little kids. The main EVIL: Refugees told that after 10 days, the hotel charges come out of their "reperations", (in Jerusalem, they were told that from day 1 the hotel cost are deducted), no one from Sela to talk to, no one from the government to help them, nothing. Sela has the same 6 months to come up with solutions, yet failed miserably. 2. Pitzuim (reparations/compensation). The Government has been lying to the world that each family will receive between 250,000 and 500,000 dollars. I personally saw this on CNN. Well, the family of 7, that lived in Gush Katif for 13 years, with 2 homes (combined into 1), that have lost both their jobs are entitled to a whopping $170,000. Out of this amount comes moving expenses (using only Sela approved movers -- but more on that in a minute), and any "temporary" expenses like the hotel that Sela provided them, or living/housing expenses for the next 2 years...). 3. Extortion. The Sela organization uses only "approved" movers (2 companies - no kickbacks there). The movers who get paid 420 NIS a day to move Gush Katif belongings, usually only get 190 NIS a day to move anyone else in the rest of Israel. Now, lets say you want to move your stuff out of your home in Gush Kaitf -- the movers are more than happy to charge you inflated moving prices, and they kindly give you 30 cardboard boxes. If you need more boxes; no problem! They charge you 1500 NIS for every 10 additional boxes! Pretty impressive? Now, if you manage to get back into Gush Katif, you need to take the bus, so you can't even take your own boxes. Luckily, I was one of the few people in the entire country last week, to get a permit into Gush Katif for 2 vehicles. My kids collected hundreds of cardboard boxes to bring into Gush Katif so that the refugees wouldn't have to pay these insane prices for boxes. The stories are now starting to come out that some who managed to get back to their homes to pack have found thier homes ransacked by the moving companies. c. No orange clothing or kippot. d. No signs of any kind, including "Am Yisrael Chai"
e. No Flags of any kind. f. No leaving the convoy for any reason, or it would forfeit our right to enter Gush Katif permanently. We were told that failure to comply with any of the above conditions would result in immediate arrest, and that others were already arrested for violating these terms. I scrubbed my van clean of all traces of orange, removed stickers, flags, and the like. Wore a plain grey kippa, and wore my MDA t-shirt. The convoy left from Ashkelon at a pace of 40 kilometers an hour. After going through 5 police and IDF roadblocks, we approached Kissufim A roadblock. A police officer jumped in front of my van, and started screaming at me to pull out of the convoy. I politely told him that I wasn't allowed to leave the convoy and I showed him my MoD permit into Gaza, my MDA identification and Driver's license. He shouted that he couldn't care less about my permits and that I was leaving the convoy or he would personally "destroy me" -- and he started yelling for other police to surround my car. I said that if we get out of the convoy, then we won't be able to get into Gush katif -- and he cursed back at me, that he couldn't care less. He continued screaming, cursing and yelling at us, pulling out a police baton, threatening to cause me severe bodily harm. The other passengers of my van were horrified by the brutality of the police -- if I would have used a fraction of the language that police spewed at me, I would have been arrested for harrassing an officer. I pulled out of the convoy, jumped out of my van and ran straight for the road. Luckily, an IDF soldier saw me (and recognized that we were from the convoy) and protected me from the brutal police officer, and told him to let us go through. The policeman turned in the other direction to let his wrath out on his next unfortunate victim. Never in my life, have I personally seen such hatred and vile behaviour from a Jewish policeman; the venomous language and evil wrapped up in the policeman almost landed me in the hospital. I will continue soon writing about the looting (with permission of Sela) of palm trees, homes, and neighborhoods of Gush Katif, the apathy of Sela and the government, and the cynical use of soldiers to enforce the policy of the Sharon family. We interrupt the regular blog from the Muqata with this special report from Chomesh in the Shomron. Jameel is currently under siege in Chomesh. He has asked me (Joe Settler) by phone to keep updating the blog for him until his outside communication lines get cut off. Sitting in his tent, with his 9 year old daughter, the report just came out, Northern Samaria is officially cordoned off and the deportations will begin within the next few days (G^d forbid). From his tent Jameel reports he has a stunning view of Israel’s coast, including the Hadera power station, Netantya, Herziliya (including the Herziliya hi-tech park which houses a major segment of Israel’s hi-tech community). Looking northwards, Jameel reports seeing Jenin, and Afula - just a stone-throw away (or more accurately a Kassam mortar lob away). Jameel is currently residing in a tent on the lawn of a Chomesh resident, sharing the lawn with 10 other families. Families that came specially from Kiryat Shmoneh, Shalavim, Tel Aviv, Ramat Gan, Ginot Shomron, and even Australia. His daughter is currently writing a journal of these events, which will no doubt shape her ideas and beliefs in the future. She said she looked to Anne Frank for inspiration for writing this diary. Jameel has just informed me that there is an emergency town meeting with an important update. He has to go and we will continue this blog later, until the Sharon family cuts off his outside lines of communications. Kikar Malchei Yisrael - August 2005. While the Israelite spies cried and complained about Eretz Yisrael in the desert after leaving Egypt, this month hundreds of thousands of Jews are willing to follow in the spirit of Yehoshua and Calev. This land is ours - and we can inherit it. We are not tired and weak spirited. More tomorrow on Tisha B'Av. Over 150,000 (some say 250,000) Jews packed the old city of Jerusalem last night for the largest Jewish prayer gathering in the Old City, since the destruction of the Second Temple, 2000 years ago. While the "Disengagement" may not be more of a small callous blip on the radar screen of Jews outside of Israel, the unusual combination of Ultra Orthodox, together with all types of settlers and nationalistic religious Orthodox made last night's "atzeret tefilla" all the more unique. Starting from the Jaffa, Zion, and Ashpot Gates all the way to the Kotel, through the shuk -- the Armenian and Jewish Quarters were standing room only. I only managed to get to the top of the stairs in the Jewish Quarter before I could physically not move forward another inch. I've been to almost every pro-Eretz Yisrael demonstration and Atzeret over the past 14 years, and never have I seen the Old City as packed as it was last night. With tears running down people's faces, there was a common, collective, unified call to the heavens, for Divine intervention to stop the expulsion plan against thousands of Jews from their homes in the land of Israel. "Aveinu Malkeinu" was read line by line, as the hundreds of thousands answered in prayer, culminating with Tehillim and Shma. There was a clear feeling of Yom Kippur in the air, as people felt they have done as much as possible to prepare for next week. Let us merit, Next Week in a Rebuilt Jerusalem. Are You Brave Enough to Throw Tehilla Cohen from her Home in Kefar Darom, Gush Katif? Five years ago (Nov. 20, 2000), Muhamad Dahlan planned and executed a horrific terrorist attack against an Israeli school bus, going from Kfar Darom to Atzmona in Gush Katif. As a result, 2 adults were murdered and 9 injured. Among them, the Cohen family from Kfar Darom three little children: Tehilla (8) lost both legs, Orit (11) lost part of her right foot, and Yisrael (7) lost his right leg. 5 Years later, the Sharon Family now wants to use the Israeli Army to forcibly evict this family, and 8000 Jews from their home in Gush Katif - and give their homes to the leadership of...Muhamad Dahlan. Do you have the strength to go to this child's home, and forcibly evict her, her siblings, her parents - so that their homes and land will go to the very terrorists who committed this atrocity? Is this an order that should and can be obeyed? As a soldier, can you see yourself turning against your fellow Jews, and evicting them, while the enemy rejoices and inherits the land of their victims? And for what? As a "unilateral" eviction, Israel gets absolutely no security guarantees in return. While you may think the "Disengagement" is a great idea - do YOU have the strength to evict this child from her home? Every Motzei Shabbat, (Saturday night) close to 10:30 PM at night, people from all over Israel brave the humidity and gather for a melaveh malka outside the walls of the Maasiyahu prison. But back to the prison. Men on one side, and a long fence separates them from the women. And the MC from Gush Katif, with his guitar starts a slow tune. Its not lively dancing, rather soulful. רחם נא על עמך ישראל May G-d have mercy on his people of Israel. The circle starts with 10-15 people, and slowly grows to hundreds, encompassing most of the sandy lot. The slow music and the songs of heartfelt prayer rise up and over the prison walls to the prisoners on the other side. Those who have already been released come back for the Saturday night's outside the prison walls -- they say its gives those on the inside lots of encouragement. The high point of the evening is when the MC turns to the walls and says into the microphone, with the loudspeakers facing the prison, "To our brothers and sister inside, give us a sign that you hear us!" Its suddenly totally quiet, and from over the walls, we can hear a distant shout of "Shavua Tov." The crowd then yells back in unison, "Shavua Tov", and we know they hear us. The regular police and assorted border policeman ignore this huge weekly turnout. They know we aren't a problem, and that those on the inside aren't the problem either. They would rather be doing anything else, than being involved in the disengagement. There are serious issues to deal with, and we're not one of them. Before I end today's posting, here's a neighbor's upbeat video, "My Heart is Orange"
Driving to work this morning, I was late. I take the exit ramp of Route 6, the trans-Israel highway, when I see a cop up ahead at the intersection. I slow down and see to my right, a large van on fire. I ask him if he needs a "chovesh" (EMT). He almost grabs me out of my van yelling "yes, yes"
I put on my EMT vest as I get out of the car, grabbing my EMT equipment (I volunteer) and see 3 vans all smashed up in the intersection...people running everywhere, some bleeding, some limping. A policeman brings over a walking wounded with a head wound. I tell the policeman to sit him down at the side of the road which I look for the more critically wounded. I hear the police yelling at the MDA (Magen David Adom/Israel Emergency Services) dispatcher to send lots of ambualnces. Then I see in front of me, 2 people trying to do CPR on a person. I sruvey the scene for more victims, as they start yelling for equipment. I give out gloves to everyone and take out my oxygen balloon. I give the pair an Ambo breathing Oxygen mask+pump, grab a bystander and show him how to hold the person's head, while the pair continues CPR. I try to look into the badly mangled van and see more people in bad shape. I grab a support collar for someone to put it on one of the people who's unconcious. I've trained for situations like this, and part of you goes into automatic mode; ignoring the pain, the scenes, the blood everywhere. The other part of me is having a slight problem comprehending the enormity of the situation. The ambulances start showing up, and I feel alot better, having fellow MDA people around. We start evaluating people...there are lots...10, 20...30 of them. We need to move the badly wounded away from the van. Fire trucks help cut the van open to extricate the wounded. Suddenly, while helping with CPR on a person, a rain of glass covers us, as the firemen smash the back window of the van open. MDA doctor came over and declared the person dead...move on to someone else. An hour later, I drove home to change, shower, and try to go back to work. Its only starting to hit me now...doing CPR on someone who doesn't make it. The chest thrusts where I can feel the ribs are all broken up inside. The limp head, as I help someone keep it stable. The listless eyes of someone who was alive minutes earlier. I'm lucky. 30 seconds earlier, and my van would have been hit too, and I could be there lying on the ground, clinically dead. Didn't save anyone this time...but I'll keep trying. At what point does an IDF soldier refuse an order? If he's told to eat non-kosher food? If he's told me needlessly do work on shabbat? what if he's told to evict feelow Jews, men, women, children, grandparents, and graves from Gush Katif? Does it make sense that the IDF is supposed to do this? Is this an order that a soldier is expected to follow? Why are IDF soldiers being given this kind of job in the first place? Because they are an "easy" workforce for the Sharon family to mobilize. Many career soldiers are finding themselves in a huge quandry. They signed onto the army to serve and protect...not evict Jews. Soldiers in the IDF engineering corp didn't sign up so they could blow up shuls. Soldiers in the IDF Rabbinate didn't sign up to dig up Jewish graves. IAF pilots didn't volunteer, so that the Sharon family would send them to prevent Jewish demonstrators from trying to leave Kefar Maimon...and these pilots have a problem. Most of them are against this whole mess, yet they feel that if they refuse they are throwing away the past years of training, and their future of being EL-AL pilots. Career soldiers do not want to be a part of this, yet they fear their pension benifits, and have clearly been told: follow orders or no retirement. Follow orders, or the past 15 years you served in the army will disappear. The Sharon family is severly weakening the IDF, thereby endangering Israel's security. The IDF is the army of the people, and to force such a horrible job upon the army is bad for the army, bad for the country and bad for the entire nation. For those readers who understand Hebrew, here's an interesting video clip. The Sharon family is weakening Israel's unity and weakening the IDF -- and its all very democratic. Yet their total and brutal lack of concern for Israel's societal cohesiveness is scary, irresponsible. and just plain evil. Is the land of Israel just Real-Estate? Sorry I've been away - my wife gave birth and I've been busy at home. Is the land of Israel just Real-Estate? Is that why pro-expulsion Jews ask "whats the big deal? The settlers are just swapping one house for another, stop crying already." This sort of statement comes from those who view Israel as real-estate, without any religious or spiritual connection to the land. Probably the same sort of people who would be happy for the State of Israel to be in Uganda. And, probably the same sort of Jews who want to make a buck by selling dirt from Nezarim on ebay. When a Jew builds a house in the Land of Israel, builds a family in the Land of Israel, works the ground in the Land of Israel, they are re-connecting Judaism to the land. G-d's presence is being restored to the land, and the words of the Biblical prophets come true to life. Book of Amos. Chapter 9. 13 Behold, the days come, saith HaShem, that the plowman shall overtake the reaper, and the treader of grapes him that soweth seed; and the mountains shall drop sweet wine, and all the hills shall melt. 14 And I will turn the captivity of My people Israel, and they shall build the waste cities, and inhabit them; and they shall plant vineyards, and drink the wine thereof; they shall also make gardens, and eat the fruit of them. 15 And I will plant them upon their land, and they shall no more be plucked up out of their land which I have given them, saith HaShem thy G-d.